Hello fellow Secret Squirrel enthusiasts! With much delight I solemnly swore to secrecy and obliged to fulfill my duties. It was a long taxing flight for Secret Squirrel from Melbourne to San Diego and under the cloak of darkness, he made it safe and sound. 5 acorns of inspiration... a very tricky mix to say the least. It was a bit taxing on the brain to think how the heck I was going to create a cohesive outfit that would fill the criteria and still be wearable (not "costume-y"). And with a little help from my colleague (aka: MR.), we devised a plan. 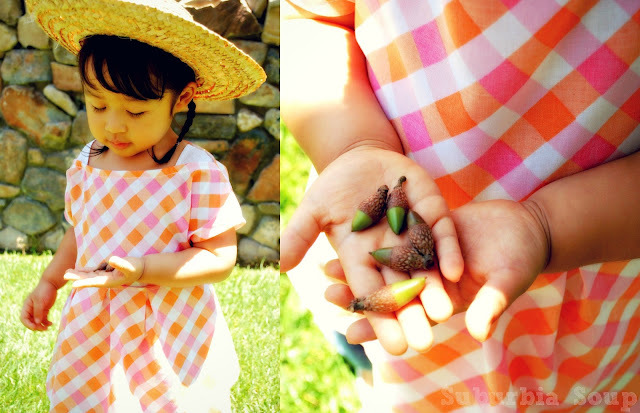 Can you spot all five acorns in the previous pictures? Such a cute and simple top, no? Hmmm... yes, I would even go as far as to say, "basic". What is a seemingly basic blouse, it has a hidden pouch! I cannot take full credit for this. Mr. had the brilliant idea of incorporating marsupials and thus the pouch was born. 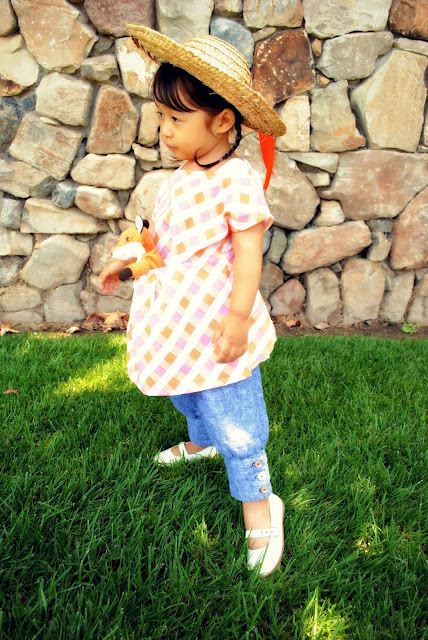 Lala loves toting her friends around and this is perfect for when she wants to have her hands free for other things. I have used this pattern before, but with a different type of pocket in front seen HERE. With a little cutting here and adding there and after 6 muslins, I managed to create the hidden pouch. The only real pain in this was aligning the plaid. That in it itself almost drove me bonkers. The plaid fabric was a God send. Another "angels singing and light gleaming" moment. It's a thrift find several years back of a bed sheet. I loved the colors and just kept it hidden away for future use. So when I dug through and found this, you can imagine how tickled I was to not only find something old, but with the tangerine color in it. Okay, before I move forward, I gave up on aligning the darn plaid on the sides. My sewing ADD took the better of me. I changed up the back. I wanted to somehow include a petticoat, but I didn't want to go all crazy by adding ruffles and making it super poofy, so I went with a simple lightweight eyelet fabric in white, did a simple gathering and added "flaps" to mimic an apron or skirt. The flaps also help balance the weight in the front when a little friend is along for a ride in the pouch. Now when I first read Suz's post for the next Secret Squirrel challenge and saw "Anne of Green Gables", as an inspiration, I chuckled. I just remembered watching the show and reading the books. SO-so long ago. The one thing that comes to mind when I think of Anne Shirley is her hat and braids. I had to have the hat. Finding it was another story. I found something very similar on line, bought it and hoping it would get here in time, to only put a kink in my plans and long story short, it never came. Just when I thought I was seeing the light at the end of the tunnel, I had to search for a replacement. Visiting three hat shops and almost buying a hat for $40, I found a hat in the most unlikely of places... a craft shop. *face palm* Duh! Of course... why didn't I go here in the first place?! And the price? Get this... $1.99!!!! 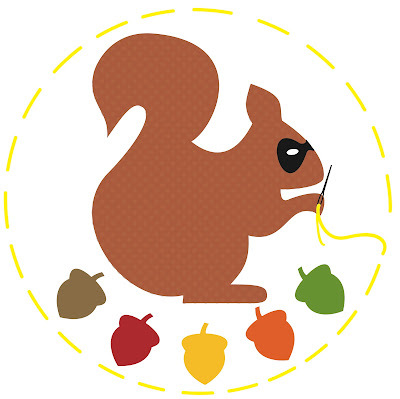 With time to spare, I decided to make an unofficial honorary Secret Squirrel patch. This is my first official attempt at hand embroidery. Oh sure, I've done little things like stitching words, but not anything of this size and certainly not satin stitching. So it's not the best stitching, but it definitely fulfilled my mission. For anyone who is interested in stitching up a patch of their own, feel free to grab this pic and stitch it up! Or if you like, shoot me an email and I can send you the PDF. And there you have it, SS Comrades! I have fulfilled my duties and successfully completed the mission. If you would like and join Secret Squirrel on his journey, leave a comment on this post and check your inbox in a week’s time… you may be the chosen one to pass on the baton of creativity that is SECRET SQUIRREL!!! If you don't receive a message from Secret squirrel, you can still sew along (link to ss flickr group -http://www.flickr.com/groups/secretsquirrelsewalong/) Prizes are being organised and are going to be super cool!! Kind Regards from SECRET SQUIRREL (AKA Suz and An). Oh this is great! What a fun outfit!! I love your interpretation of the acorns of inspiration. The tangerine top with the marsupial pouch is brilliant!!! Very impressive....especially that hand stitched patch! You pulled off a great outfit and incorporated all of the acorns...very nice! And I love that secret marsupial pouch! I would love to be considered for the next stop. I love it! So wearable, too! You did an impeccable job matching that plaid--I had no idea there was a pocket hiding there! And, of course, you KNOW I'd love to have SS hop on a flight to southwest Missouri! I have somehow totally missed this series - so fun. I will be following along from now on for sure! Absolutely lovely! Such a precious design. I have an idea for a boy's look with those fabulous acorns! So, so cute! I love this series so much and would love to be the next stop on the circuit! My SIL is traveling here from San Diego in a few week's time - maybe the squirrel could tag along with her? Venus!!!! You have well and truly conquered your mission!! Thank you for such an amazing outfit and all the effort you went to to please secret squirrel. Just amazing!!! Venus! YOU DID IT!! 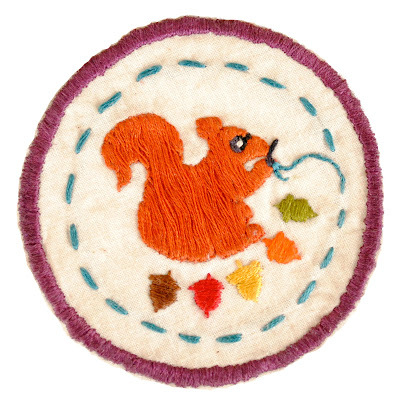 Aww... the pocket and the secret squirrel patch!! Grrrreat job! I've been adoring the secret squirrel.. of course I want to try stiching him! And.. why don't that squirrel come to my house? He can have some Japanese food..Have some miso-soup and onigiri(a.k.a. rice ball)! The design of that shirt is great - I love the back! And my daughter would LOVE the pocket. It's funny - I live in Atlantic Canada, somewhat near Prince Edward Island where Anne of Green Gables is set. And where ever I go in the world, people may not know much about where I come from, but they always know Anne of Green Gables. I love your acorns! It's so smart! 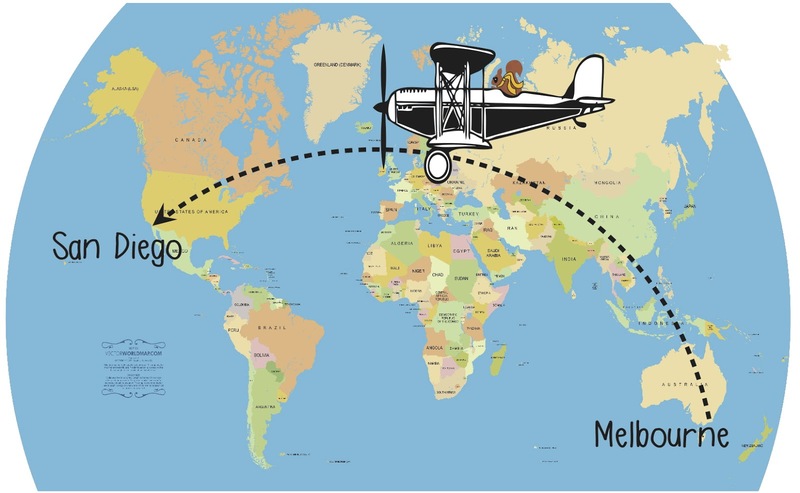 And I would love to be the next Secret Squirrel - from San Diego to Norway! Love that shirt! It's absolutely adorable! This is such a fun series! 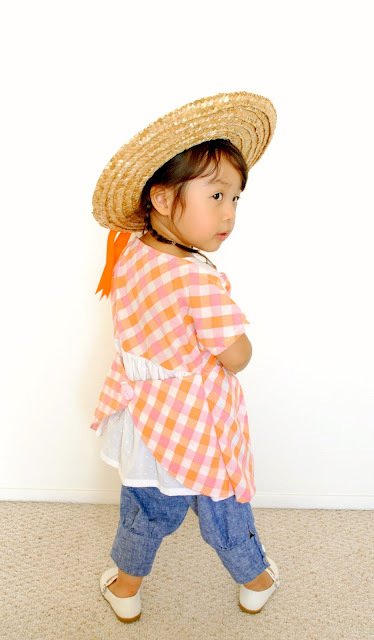 Lovely Outfit!. You have achieved in a fabulous way the squirrel's acorns! I'm in love with that marsupial pocket at the front of the shirt and no less with the petticoat detail at the back! Canada is beautiful at this time of the year!!! And the secret squirrel would be in great company at my house! Haha! 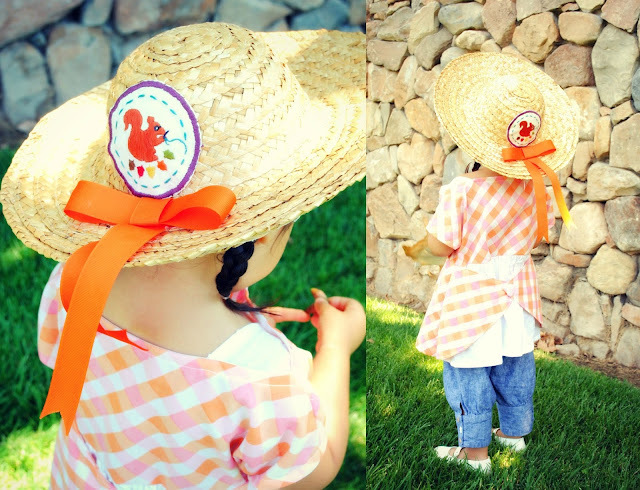 Amazing job on the outfit... so sweet and practical to boot! 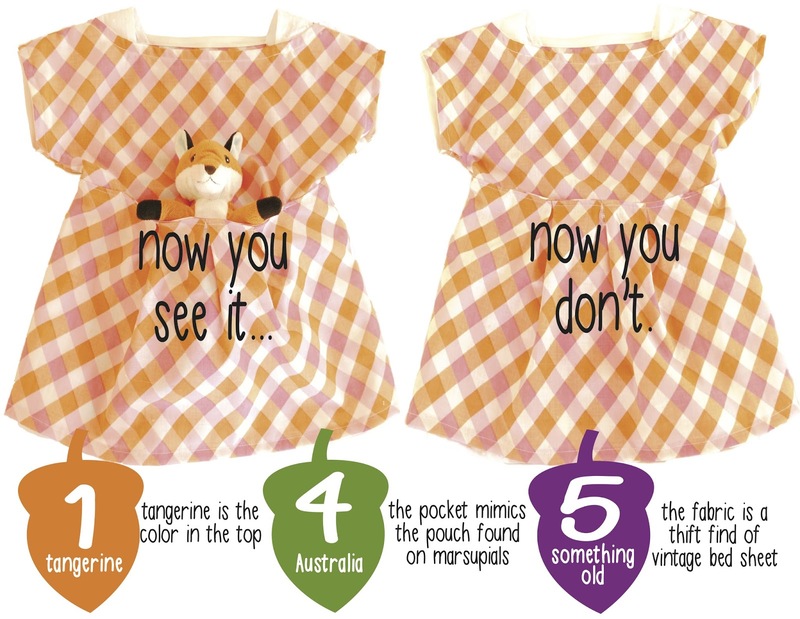 I'll definately be incorporating marsupial pouches in future outfits for my little ones! the pouch is awesome!!! Love what you did the the acorns! Of course I would love to have the squirrel stop here! Lovely! I've also picked up the Acorns and have been sewing along. Would love it if you'd pop over to as-it-seams.blogspot.co.uk and take a look! Interesting how different ideas from the same Acorns. But also similarities! (I also pondered how to do Anne of GG without sewing a period costume!) Love the pocket! Inspired...I didn't do very well with the Australia Acorn! Awesome! I wanted to sew along with this one (can't say no to anne of green gables) but didnt have the time this month :( Can't wait to see what else comes out of this! Holy hot peppers! That was an impressive collide of totally random 'acorns'...that alone is a serious accomplishment. Nice work. 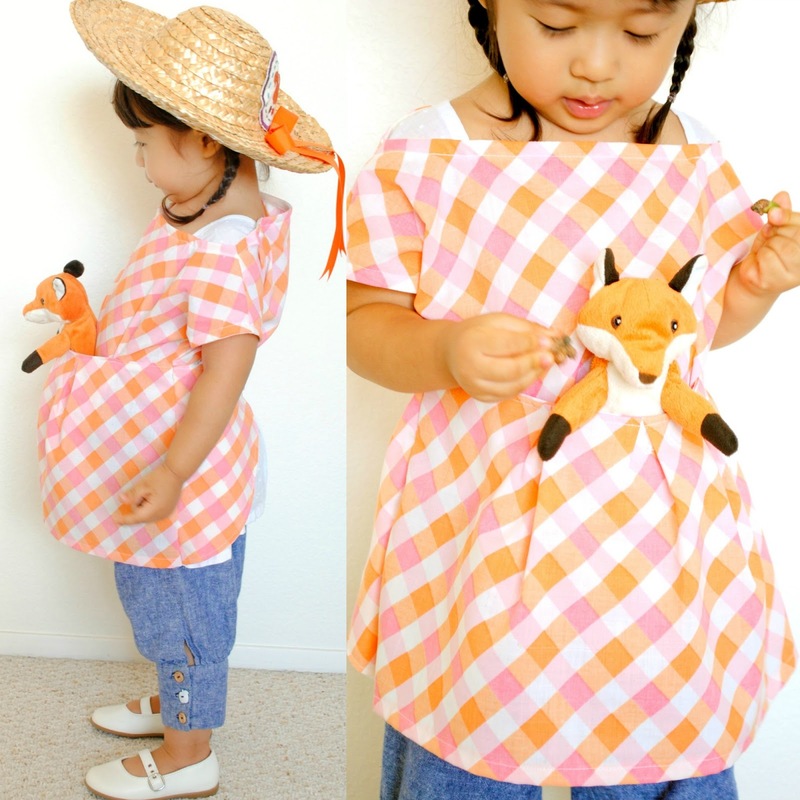 The pouch is so fantastic and I would guess it is well-loved, what child doesn't love secret little places like that! And, the patch!! Love the patch! 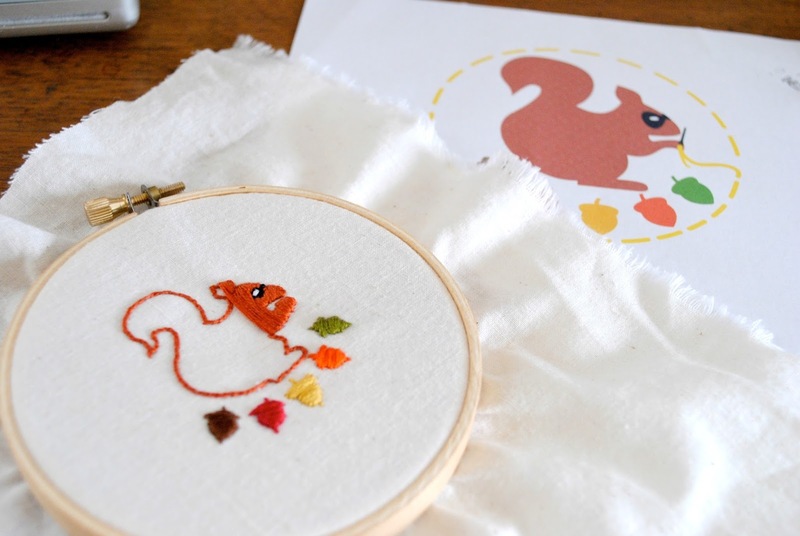 I can't even draw a squirrel nonetheless embroider one! Oops, maybe I shouldn't confess that! Lest I be kicked off the list of contenders. Naw, better to get it out of the way. 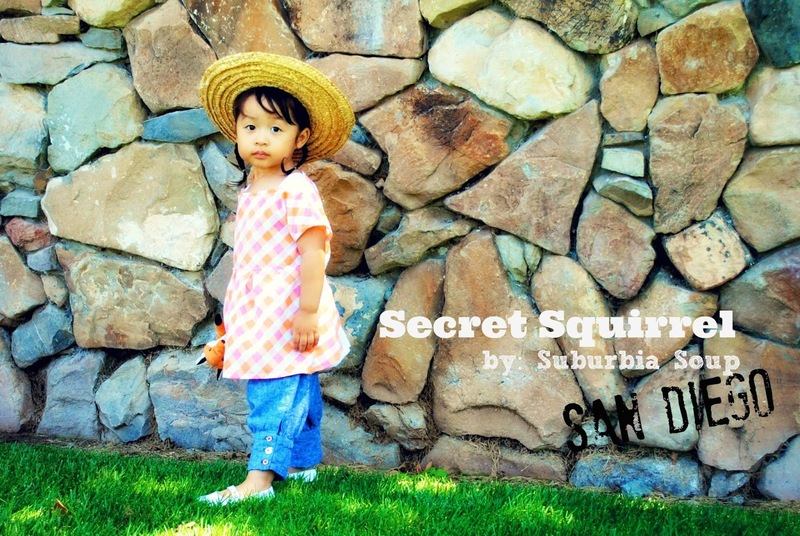 You should send the squirrel all the way to me here in New jersey, I will teach it street smarts and suburban survival. Wow! that's lovely. I'm so in love with your "some thing old" in "tangerine" theme, very cheerful fabric. And that hidden pouch! Incredible. ohmygoodness!! love the kangaroo pocket!! and i would love to be a secret squirrel and blog it! I LOVE that plaid fabric! The colors are gorgeous! and of course making a pocket in the front is brilliant!! Genius! Love the patch too. LOOOVE it! You are amazing! The kangaroo pocket is the best and the whole outfit is just so damn beautiful. Eek!! 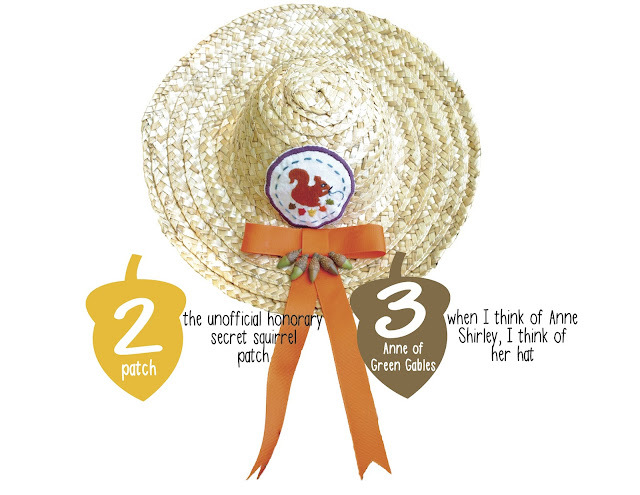 As soon as I saw the hat, I could see Anne of Green Gables written all over it--she is my all-time favourite historical/fictional Canadian homegirl! 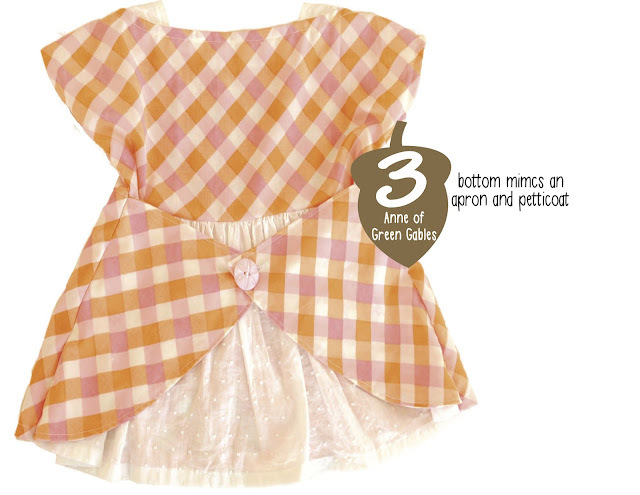 I love the pink/orange gingham on the bias, the cute hidden pouch and the patch is freakin' awesome! Well done! Oh my, Venus, this is AMAZING! The top, the patch, the pouch... Brilliant. This must have taken you SO much time! And I love those new acorns too. Cannot wait to see how the next host will use them! I so very much love how you found the hat...it is Anne! I love how you tied everything together too! Well done indeed. Wow! I love how everything was incorporated, but the reverse of that little top is the best. I love the 'surprise!' factor of the turnaround. Classroom in the front, flower girl in the back... woot! Such a great interpretation! Well done secret squirrel!! This is amazing. The back is my favorite. And that perfect little front pouch. So cool. This sewing challenge seems crazy hard to me- you really nailed it! I bet my LilPotato would like to have a secret kangaroo pocket in front and a petticoat on back... Will copy for sure! This outfit is amazing! 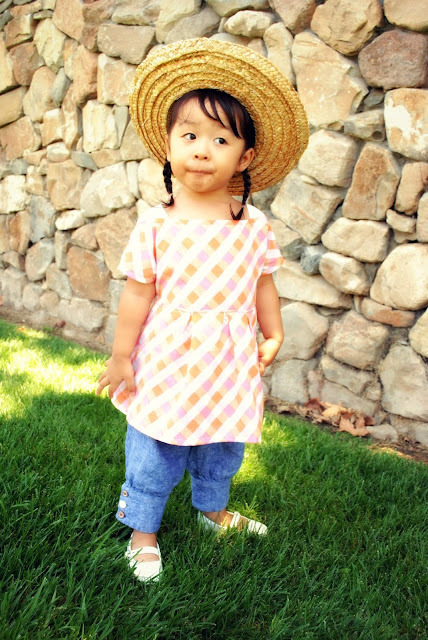 I love how you tied it all together while making it adorable and something she can wear!